"By the mid-1980s, I had collected about 500 45s that dealt with the Vietnam War," Kessing says. "The perceived impact was such that, within several weeks, there was already the first 'answer record' — 'Dawn of Correction' — where a very clean-cut group of young men, who included members of Danny and the Juniors, decided that it was important to refute, point-by-point, some of the claims made in 'Eve of Destruction,' " Kessing says. A number of soldiers recorded their own songs while serving in-country, and an entire disc on the new set is devoted to them. 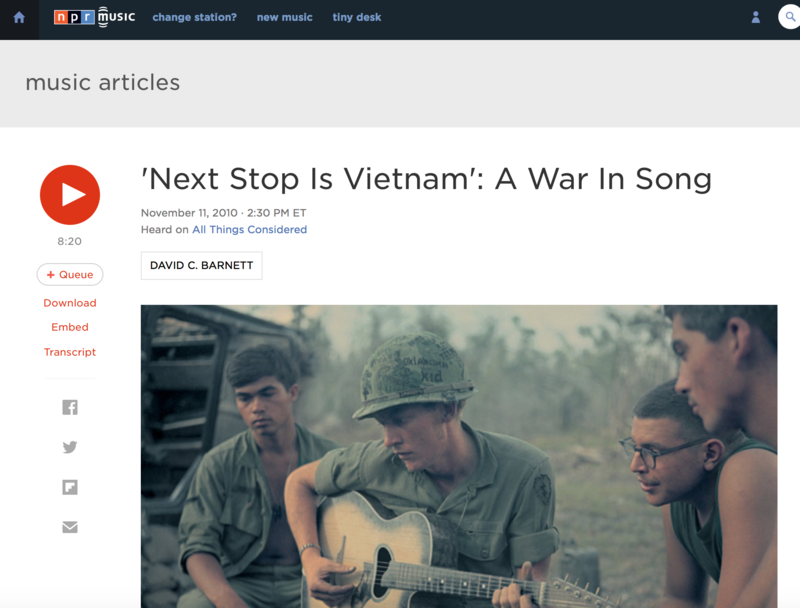 One is "Battle Hymn of the Republic of Vietnam," a take on the daily news briefings conducted by the U.S. government press office in Saigon, recorded by — perhaps with good reason — an unidentified military staffer. "By the early '70s, as troops were arriving in Vietnam, they were singing 'I-Feel-Like-I'm-Fixin'-to-Die Rag,' " Kessing says. "It was an indication, not only of how divided the nation was, but there was almost a gallows humor in singing, 'Whoopee, I'm going to die,' as American troops are coming to Vietnam for the first time." "To this day, I listen to that song and I get pissed off," Begala says. "It tugs on your emotions and your anger — tugs on your disappointment, and the rage. My god, it takes you right back."